Model space viewports enable you to see several views of the model at one time in AutoCAD, each from a different viewpoint. For this reason, model space viewports are especially useful when you’re creating and editing objects in 3D. As you draw and edit, the different views help ensure that you’re picking points that are located correctly in 3D space. Model space viewports divide the screen into separate rectangles with no gaps between them. Unlike when you use paper space viewports, you can’t move, stretch, or overlap them. You can’t plot multiple model space viewports. (That’s what paper space is for.) And, unlike the situation in layouts, a layer that’s visible in one model space viewport is always visible in all of them. You may hear or read references to the tiled viewport, which is just another name for the model space viewport. Tiled refers to the way in which model space viewports always fill the drawing area, with no gaps and no overlapping allowed. Conversely, paper space viewports are sometimes called floating viewports because you can move them around, leave gaps between them, and overlap them. One of the best 3D viewing features goes by the somewhat obscure title of the in-canvas viewport control. This little text label that you may have noticed at the upper-left corner of the graphic area is a clickable control that lets you set the visual style and the view. We highly recommend working with multiple viewports when you’re modeling in 3D. That way, you get to see exactly what you’re doing in all three dimensions, in real time. The in-canvas viewport toggle switches back and forth between the last multiple viewport you set up and a maximized viewport. Follow these steps to set up the tiled-viewport configuration. 1If you’re not already in the 3D Modeling workspace, click the Workspace drop-down list on the Quick Access toolbar and choose 3D Modeling. 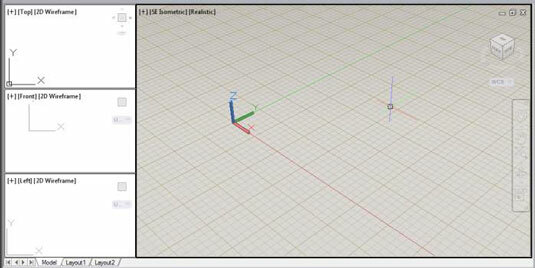 You can also click the Workspace Switching button on the status bar and select 3D Modeling. If the Materials Browser palette opens, close it. 2Click New on the Quick Access toolbar to open the Select Template dialog box. If a new, blank drawing appears and you don’t see the Select Template dialog box, someone has assigned a default template to this button in the Options dialog box. In that case, click the Application button (the Big Red A) and choose New, and then choose Drawing from the submenu. 3Choose acad.dwt (choose acadiso.dwt if metric is your preference), and click Open. Yes, there are ready-made 3D templates (acad3d.dwt and acadiso3d.dwt), but starting this setup is easier from a 2D template. 4From the Viewports panel on the View tab of the Ribbon, choose Named. The Viewports dialog box appears. 5Click the New Viewports tab to make it current; then choose Four: Left (our preference) or Four: Right from the Standard Viewports list box. The Preview panel shows a large, squarish viewport occupying most of the work area, with three small, squarish viewports stacked on the left (or right). The default 2D setup shows the visual style of all four viewports as 2D Wireframe. 6From the Setup drop-down list, choose 3D. The visual styles remain as 2D Wireframe, but the view direction (listed as Current in 2D Setup) is now SE Isometric in the large viewport, and the three small viewports show Top, Front, and Right orthographic views. 7In the Preview area, click inside the large SE Isometric viewport and then choose Conceptual from the Visual Style drop-down list. You’re almost finished. Rather than complete this setup every time you want to do some modeling, give the new viewport configuration a name. 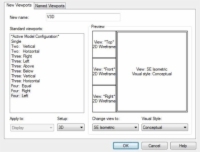 8In the New Name box at the top of the Viewports dialog box, enter a name such as V3D, for example, for the configuration. 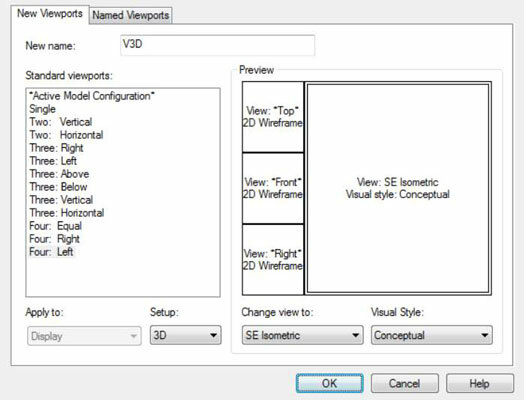 After you close the Viewports dialog box, you can restore this configuration at any time by clicking the Named Viewports tab, choosing V3D, and clicking OK.
9Click OK to save the viewport configuration and close the Viewports dialog box. The Home button in the ViewCube can trip you up by changing to a view you don’t expect. If you want to keep the current SE Isometric viewpoint, be sure to reset the Home view. To do this, simply right-click anywhere in the ViewCube and choose Set Current View as Home from the menu that appears. And because you’ve gone to the trouble of setting up a shaded 3D viewport, you might want to make it a little more realistic and turn on perspective mode at the same time. 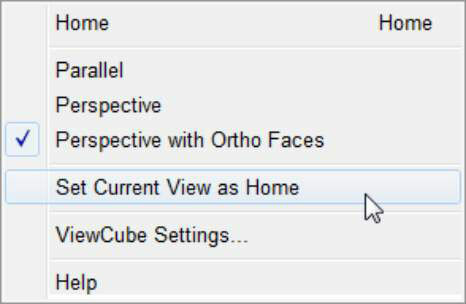 10In the large 3D viewport, right-click the ViewCube to display its shortcut menu and then choose Perspective with Ortho Faces. Selecting Perspective shows the orthographic views in Perspective mode, and usually you don’t want that. Selecting Perspective with Ortho Faces resets the projection mode from Perspective to Parallel when you switch to an orthographic view. 11Repeat Step 10, this time selecting Set Current View as Home. Now you can readily return to this viewport configuration, keeping the same viewpoint in all viewports, perspective projection in the 3D viewport, and parallel projection in the orthographic viewports. To return to a single viewport later, simply click the plus (+) sign on the in-canvas viewport control. The last thing to do is save the configuration you just set up as a template (.dwt) file. 12Click Save on the Quick Access toolbar. From the Files of Type drop-down menu, choose AutoCAD Drawing Template (*.dwt) and enter a filename. Click Save. AutoCAD saves the new 3D template file in the same location as your other templates so that you can always select it when you want to do some serious 3D modeling.